The device is designed for automatic separation and removal of necks from carcasses. 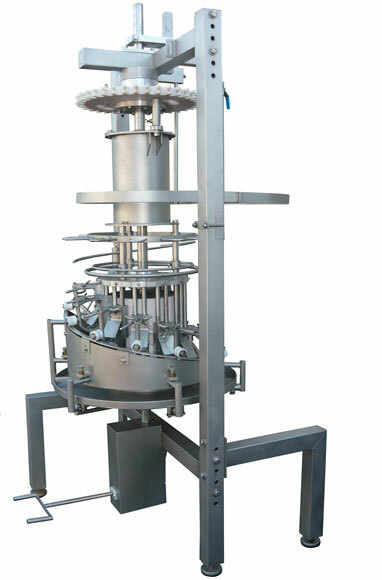 The machine is placed in the evisceration line, after the automatic cropping machine. The device is manufactured to operate with shackle distance of either 6 inch or 8 inch. The neck remover is constructed of stainless, acid-resistant steel. Several components are made of food-approved plastic or aluminium. Simple design and materials used for manufacturing the machine make it easy to operate, easy to clean, effective and reliable. The basic structural element of the machine is the frame. It is made of hollow sections. A drum which can move freely up and down, depending on the need, is set upon the frame. The machine is equipped with manual, mechanical lift made of stainless steel, used for adjusting the required height and for disconnecting the machine from the drive during washing or servicing operations. The driving wheel takes the drive from the overhead chain conveyor. Carcasses enter the machine with their breasts outside and their backs turned towards the centre of the machine. The machine is of carousel type, driven by the overhead conveyor. The neck separation and removal system operates on sliding blocks which move vertically along the bars mounted to the upper and lower plates of the automaton. Rollers which guide the neck separation and removal system move along a specially shaped track.